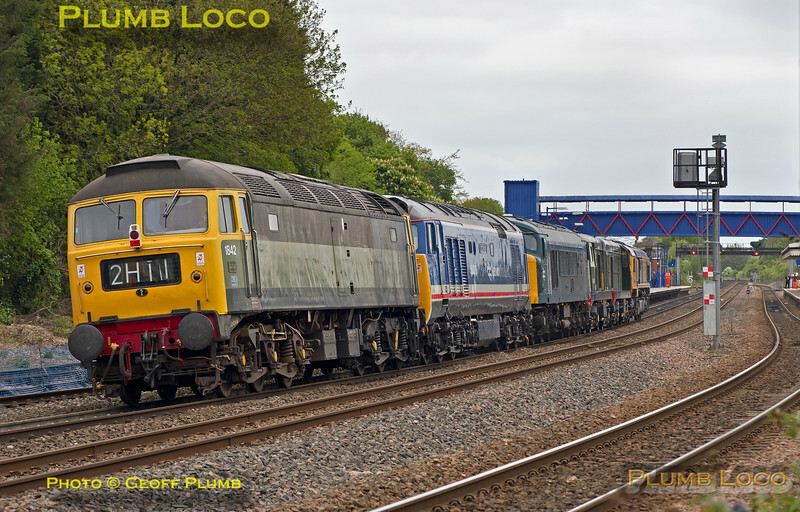 A rare sight at Princes Risborough was the convoy of locos from the Swanage Railway gala to the Chinnor & Princes Risborough Railway for their gala - this ran as 0Z41, the 09:05 from Swanage, and arrived at Princes Risborough at 15:32¾, just a minute or so late on Tuesday 9th May 2017. After a short stop at Platform 3, the convoy made its way on to C&PRRA metals on a cold and dull day. GBRf 66741 "Swanage Railway" leads the locos, followed by 20188 (D8188), 20059 (D8059), 45014 "Royal Tank Regiment", 50026 "Indomitable" and 47 192 (1842) brings up the rear. Digital Image No. IGMP27105.